The AWS SunMate is a device that takes your excess solar energy and pumps it into your hot water tank, potentially saving you more money than solar panels alone. The SunMate’s developers, Australian Wind and Solar, say that it is one of the most cost-effective ways to maximise a solar PV system’s value – and that installing a SunMate may even justify the choice of an extra-large solar system. Of the number of hot water diverters available in Australia, the SunMate is one of the most well-reputed. The device has been installed in approximately 400 homes and businesses across the country and is designed and assembled in Australia by an Australian company. The SunMate comes with a five-year warranty and local support – Australian Wind and Solar’s head office is located in Melbourne, Victoria. Hot water diverter or battery storage? Battery storage is a hot topic in Australia, with more and more homes investigating batteries as an option to store their excess solar energy. While battery storage has a lot of appeal for a range of reasons, few would argue that it is cost-effective at the time of writing except for in a select handful of situations. Hot water diverters like the SunMate, on the other hand, promise significant value at very little cost – and may even decrease the payback time of a solar PV system (while battery storage tends to extend it). For more on this topic, see our recent article about hot water diverters for solar PV. Your solar PV system produces energy when the sun is shining. In most cases, any energy produced by the solar panels is first automatically used to power your appliances, saving you in the range of 20-25c/kWh (depending on your electricity retailer and plan). Any leftover energy is sent into the grid, where it earns you a credit of only 6-8c/kWh (depending on your electricity retailer). This means that the more solar energy you consume directly, the more money you will save on your energy bill. For most homes in Australia, water heating accounts for a whopping 30% of all energy consumption; there are significant savings to be had – between $280 to $380 for a standard NSW household with electric hot water and a 5kW solar system. In essence, the SunMate’s job is to ‘know’ when your home has excess power available, and to redirect that energy into your hot water tank (or other device of your choice) instead of into the grid. A thermostat-regulated water heater will be able to ‘sense’ that it is it does not need further heating, and will therefore not need to draw energy for the grid to operate. This translates into a reduction in your overall energy bill. You or your installer can program the device to operate according to certain rules (e.g. use excess solar to run an AC unit in the summer instead of heating your water) depending on where your preferences and needs lie. Compatible with most electric water heaters -with simple, non-intrusive installation. SunMate may also be compatible with your heat pump. Intelligent power control – diverts solar energy to hot water tank when excess is detected. Also works with other appliances in the home – when switched to ‘threshold mode’, allowing for near 100% self-consumption of solar energy even when water is fully heated. Works with solar PV as well as small-scale wind. A smart alternative to the use of timer switches, which may inadvertently lead to overall higher electricity charges if household electricity demand outstrips solar energy production. Timer & boost functions – for an extra degree of control over your solar energy consumption. For example, an AC unit may be switched on during the summer when excess solar is available, or an electric heater switched on in the winter. Wireless ready – for ease in tracking system performance. LCD display for monitoring; also shows system performance over time. 5-year warranty – serviced locally in Australia. 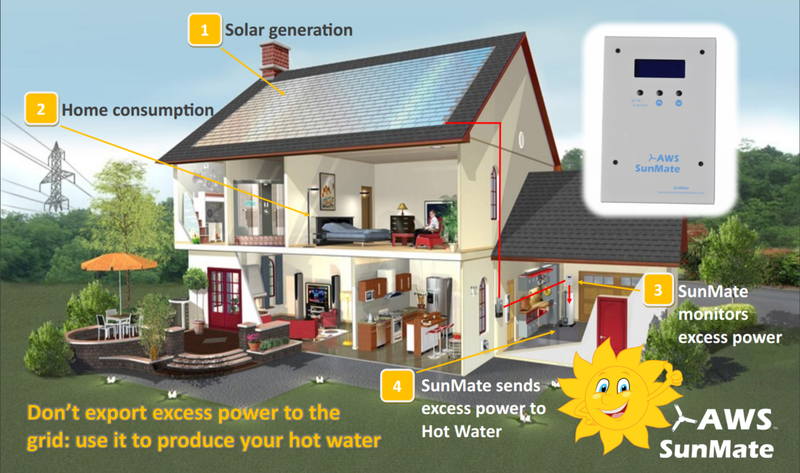 Q: What’s the case for a solar PV system owner to install a SunMate as opposed to a conventional solar hot water system? A: An average NSW home with a 5kW PV array will feed 50% of their power back to the grid at $0.05c/kWh and has a daily hot water demand of 6 to 7 kWh/day. The SunMate can save homeowners $200 to $400 per year by eliminating the off peak component of the bills. This results in a 4 year payback period, reducing the payback period of the solar installation alone. The inclusion of a SunMate saves money and is a bit of a no brainer. 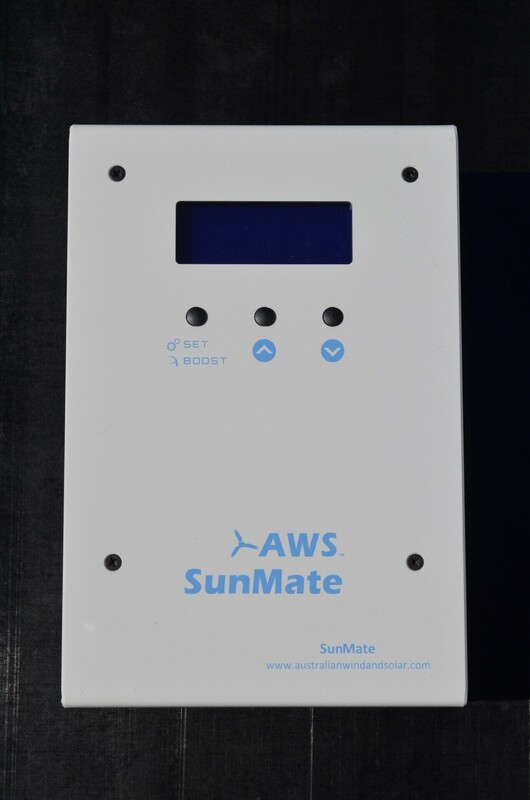 The SunMate also has a 2nd output which can be configured to trigger peak loads such as pool and water pumps, air conditioners and heat banks. This results in even greater savings. The SunMate also comes in a two and three phase versions suitable for commercial buildings, dairies, farms and industries that have large hot water demands. Q: What size solar systems are best for the SunMate? Q: What are some of the features of the SunMate that make it stand out from others in the market? The SunMate has a very good track record and has had 0 failures to date. It has technical support and warranties backed by an Australian company. We have the ability to program times to allow hot water to boost on off peak tariffs even if the customer has metered off peak on a different circuit. The SunMate has a wireless transmitter that allows for ease of installation within 100m (line of site) from the CT meter to the SunMate unit. The SunMate has two outputs (not just the standard 1 for most diverters) this allows the customer to heat 2 tanks, or to use the 2nd output to run a pool pump, heat pump, water pump, air conditioner or any other deferrable load. This 2nd output can be used to trigger what would otherwise be peak loads increasing the savings even further. One final great feature that the SunMate has that is not offered by any other product that we are aware of world wide is that the SunMate comes in a three phase version making it the only three phase diverter on the market. This development makes the SunMate ideal for three phase homes and businesses that require a three phase supply. Q: Can given an example of a case where you saw the SunMate help make a big difference in a home’s electricity bills? A: There have been hundreds of SunMates installed across australia all offering greater savings than PV alone. Taking the case of a 5kW PV system on an average NSW home that feeds an average figure of 50% of its energy to the grid with a 7kWh/day hot water demand. ($0.24c/kWh peak, $0.15c/kWh off peak and 0.05c/kWh feed in tariff) the addition of a SunMate will save the customer $300 per year on hot water alone. This figure is greatly increased if the customer makes use of the 2nd output for peak load shifting or a 2nd hot water unit. Comparison of annual electricity bill savings with SunMate and without on a home with a 5kW solar system. Previous post: Could the Renewable Energy Target once again be under threat with new government?